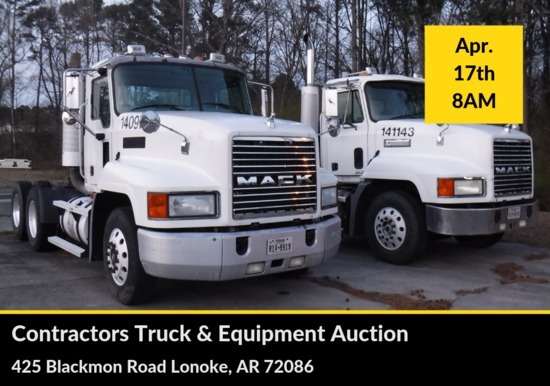 Multi lot consignments from- Pilgrims,AR-DOT,Arkansas Electric Coop,Local Contractors,Rental Companies & Individuals and More!Pickups, Trailers, Truck Tractors, Specialty Trucks/Trailers & Much More! Payment Instructions: To all Bidders - Start time, Catalog, Terms & Condition are only for online bidding. If bidding onsite please visit www.blackmonauctions.com for onsite start time, catalog and terms and conditions. HOW YOU REGISTER IS EXACTLY HOW ALL INVOICES, TITLES, AND RELATED PAPERWORK WILL READ. WE DO NOT CHANGE NAMES, ADDRESSES, OR TAX STATUS ONCE YOU HAVE REGISTERED. NO EXCEPTIONS!!! TO ALL BIDDERS - PILGRIMS ITEMS, LOTS 7000-7703 WILL CARRY A 14% FLAT, NO CAP BUYERS FEE Online Buyer's Fee - 6% Buyers Fee will be charged on the balance above $2,000.00 and a 14% Buyers Fee will be charged on every item up to $2,000.00. Invoices - All invoices will be generated and emailed after the end of the auction and not before. All invoices are sent to the register email address on your account. Paid invoices will not be sent out automatically. Buyer must request a paid invoice by send their request to mshelle@blackmonauctions.com. Please allow 48 hours after payment has been made before sending your request. Buyers do not need a paid invoice for pickup unless Broker/Hauler Company request one. We verify all online Buyer's purchases are paid with accounting before releasing. Payment Due: All payments must be submitted to Blackmon Auctions by one of the approved methods within 24 hours of the closing of the auction. All open accounts after the due period will be sent to collections and all online accounts flagged from bidding. Excepted Payment Methods - Wire Transfer (Preferred), Credit Card (3% Service Charge will be added), Overnight Check with Bank contact information to verify funds, Cash paid at our Little Rock, AR Office or onsite. Sales Tax: May apply. Please make sure your tax ID number is listed on your Proxibid Account. If we are not provided with the number, taxes will apply. International Bidders - we do not remove taxes just because you are an International Bidder. We have laws we must go by or during an Audit we are fined. International Bidder, if you do not have a US Tax Exception Number you must do the following to have your taxes refund back - this also applies to everyone else that is shipping over State line - You will need to send us a Bill of Lading from an ICC or MCC or the like Carrier (QUICKLY) SO WE CAN REFUND YOUR TAXES. It changes the transaction to an across the state line interstate transaction. International Bidders may be able to send us copies of their export papers. That must be approved by our Accounting Dept before taxes are refund. Terms – This auction is governed by United States UCC Laws which places responsibility on you, the bidder – We have provided time and opportunity for all buyers to inspect the items before they bid AND this is the BUYER’S responsibility. All items will be sold in the “as-is” condition.